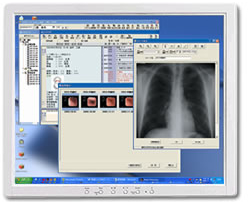 In conjunction with one of Japan's leading manufacturers of computer systems, Fujitsu, the company's comprehensive clinical testing center has successfully developed an easy to operate and highly functional Electronic medical Chart system, known as m-KARTE. Intended for use in medical facilities, the m-KARTE system aims to provide a seamless integration between initial reception to subsequent examination and treatment, and on to the final payment stage. The online nature of the system means that LSI Medience can deliver and receive clinical testing data almost instantaneously (sending out requested data and uploading test results). The system is also fully supported by the company's inherent strengths of providing a support function for clinical testing. Our sales staff and deliverer also make regular trips to clients to fully meet their demands and provide precise and tailored information and support. The company's overall corporate environment is one in which we constantly strive to improve system maintenance.